TestOil doubled its laboratory production space to meet accelerated customer demand growth! Strongsville, Ohio March 7th, 2019- Join TestOil in celebrating their new 2019 headquarters expansion. TestOil has doubled their laboratory production space to meet increased customer demand. TestOil will host dignitaries on March 7th from 10am to 1pm with representation from the Ohio Governor’s Administration, the Strongsville Mayor’s Administration, prominent Strongsville City Public Service Leaders, and valued Customers for a ribbon cutting ceremony to celebrate the dynamic business growth. For the last 9 consecutive years, TestOil was recognized as one of the Weatherhead 100 Fastest Growing Companies in North East Ohio. (2010 through 2018) To provide growth context, TestOil’s daily sample production volume started around 10 units in 1988 and is now averaging around 2400 samples per day! To meet our customer volume demand, TestOil has grown from 5 employees in 1988 to over 100 total employees today…and counting! As the business needs continue to expand to keep pace with growth, TestOil is constantly hiring and adding new career opportunities. In fact, TestOil added 76 new jobs over the last 9 years! Founded in 1988, TestOil specializes on lubricant testing, analysis and performance monitoring for some of the world’s largest industrial facilities. Our customers rely on us to be their technical experts when it comes to diagnosing oil related issues in equipment such as: turbines, hydraulics, gearboxes, pumps, compressors and diesel generators. Ultimately, our #1 goal is to prevent critical machinery downtime, failures, & loss of productivity. TestOil serves a variety of industrial companies in over 40 different countries! TestOil services approximately 40% of the power generation plants in the US; ensuring that they can continue to deliver uninterrupted electricity to the nation! Bug fix to DART Data export functionality. Enhancement to prevent the need to log in every time the asset name is clicked on the PDF report. Enhancement to the process for contacting the Analyst Department. Enhancement to include a "Check all" option for divisions on the dashboard. Updated DART to reflect improved RULER result format. A graph of lithium can now be viewed in DART Data. Bug fix deployed to resolve publishing errors. Enhancement to the MVC report interface. Bug fix to prevent an error when sorting on the Customer Review column in View Your Reports. Included applications for the different tubing sizes when ordering supplies. Total samples due and percent compliance added to the Program Snapshot. Bug fix to ensure the dashboard starts on day 1 of a month. Added internal codes to labels in the Oil Type row. Bug fix deployed to resolve equipment sorting error. Bug fix deployed to allow skipping used labels. Removed the Batch Edit message from Manage Schedule, Manage Routes, and Manage Equipment Database pages. Enhancement deployed so Division User can filter the Dashboard to view an individual division's customers. Bug fix deployed to prevent the error that was not allowing for the combination of PDFs. Bug fix deployed to prevent machine names from linking to DART data page if the machine has not yet been sampled. Enhancement added to include the "At Risk" alarm type for Varnish reports when filter by lube condition for all reports and the Dart Select Page. Updates to the Dashboard, Program Snapshot and Recurring exception page with the new parsing for Ferrous Wear. Bug Fix deployed to address the issue on both View Your Reports and Last Sample when the Print Combine PDF feature is selected for import/Non-TestOil lab results. Bug Fix deployed to address the issue of the system crashing when a Division User attempted to add a schedule. Enhancement deployed to increase the gird page size options. A user may not select 10,20,50, 100, 250 and 500. Enhancement deployed to improve the user’s ability to easily change the machine name within Program Management, Manage Equipment Database. Enhancement added to the Program Management, Manage Schedule page. The new feature provides the ability to use the batch edit feature to add new schedules. Bug Fix deployed to address the issue when linking from the Dashboard Condition Grid to the Summary Report. The filter was not working correctly. Bug Fix deployed to address the issue of report links not displaying when a user searched by serial number on the View Your Reports page. Enhancement added to Program Management, Manage Schedules Page. Users now have the ability to filter by Divisions. Bug Fix to the Program Review Report. Addressed the issue of Critical Displaying twice for Varnish Reports. Enhancement added to Program Management, Manage Equipment Page. Users now have the ability to filter by Divisions. Enhancement added to the View Your Reports Grid Export XLSX format. It is now possible to link from the spreadsheet to the report PDF by clicking on the Lab No. in the grid. Enhancement added to Program Management, Manage Routes. Users now have the ability to filter by Divisions. Enhancement added to the Manage Routes page, file export. The export now includes Division information. Enhancement added to View Your Reports. Users now the ability to down load their test data by select the grid export option. Bug Fix with "Reports" menu options being truncated when navigating from the Supplies Page. Bug Fix to View Your Report and Last Sample. Dropdown list were not displaying information. Improved error handling. Users are now notified that an error has occurred and the error information is automatically sent to IT for review. New "Program Snapshot" added under the reports menu. The report provides a historical perspective on program activity and improvement. Monthly Program View Report additional character options added. Bug Fix in the Delinquent Sample Report export. Export file had incomplete data. Bug Fix on the Manage Routes Page. The data export file was only exporting the report header. when any filters were used. DataSight User Guide was updated. Sample Status Page was updated to display all "In Progress" samples by default regardless of the current date. Tool tip/help text added to the Division Report (Program Snapshot). Express Email Notification was set for all customers. "New" Sample Status Page deployed as a pilot. Users can now see the status of their samples being processed in real time. Common Exception Report , formatting updates including adding "Other" for all other exceptions not called out in the grid. Dashboard Pie Chart updated to display Ferrous Wear instead of Wear Particle. Bug fix on the Schedule Samples Due. The bug is causing reporting that tests have been completed that have not. View your Reports - Added Machine ID to Machine Name. DART Search - Renamed customer review column. Bug Fix: View Your Reports to use OR instead of AND when using both condition filters. Bug Fix: Schedule Compliance - Fixed samples showing up on the wrong schedule when a machine is scheduled for multiple test packages. Moved the Review/UnReview from Dart Select to View Your Reports. Removed feedback grid from the Dart Data to support current tracking method. Enhancement to the Recurring Exception Report. Added custom parameter for number of exceptions. The Customer Corrective Action now provides the ability to enter Work Order information on the View Your Reports page. Bug fix on labels page to only show scheduled tests for the current month. New Scheduled Samples Due Grid and Report. Allows customers to create a work list. The Report Default Names changed to match the report when using the Report Viewer. Added “What’s New” link to the login page. Added link from last lab no. in the Dashboard Recurring Exceptions grid to the report PDF. All reports now receive sorting data from the grid so the order of items will match. Bug Fix: Add missing column to the Recurring Exception Grid Export. The "Recurring Exception" grid has be updated to display additional information on the "Dashboard". The "Recurring Exception" grid on the report page has been updated to display additional information. New Recurring Exception report is now available under the "Reports" tab. New Summary report is available under the "Reports" tab. The Schedule Compliance report now contains the "Export Grid" feature. New Report Viewer for the "Condition Summary Report". The new feature is located under the Reports Tab. Bug Fix for Corporate Users on the Dashboard. When the customer filter is changed, the Last 100 Samples updates correctly based on the filter selection. This was only an issue for Corporate Users. The removal of the old crystal report. Please note, with this sprint the old crystal report pdf is being removed and replaced with the grid export option. A new Telerik report will deploy in a future sprint as a replacement to the Crystal. Linking from the dashboard to the summary report to allow users to drill down to view more detailed information. The addition of the route number and route name to the View/Print List. The elimination of the crystal report. Replaced with a grid export. 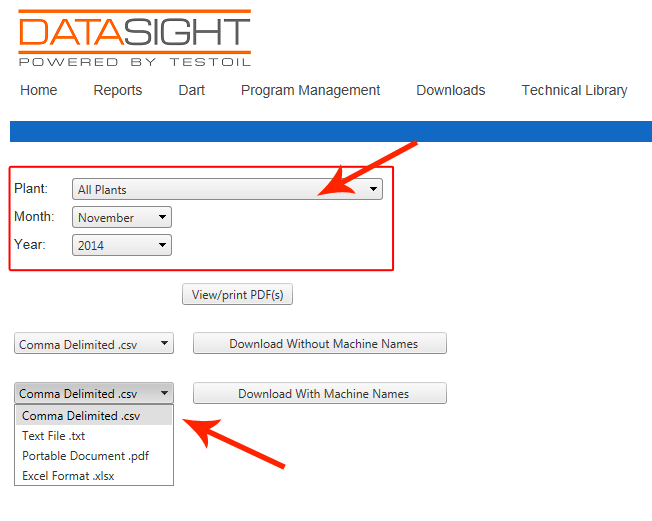 Ability to link from the report (by selecting Machine Name) to the Dart Data page without having to login again. Dart Select Customer Review Checkboxes. Once a checkbox was selected, a user was unable to unselect. If the box was checked on Dart Select, it wasn’t updating on Dart Data. The Delinquent Sample Report was not displaying an export file with the Export Grid option was selected. Drilldown capability has been added to the dashboard. Within the condition grid, customers can now select any number in the grid and be linked to the View Your Reports Page with the filters in place from the Dashboard. The Exception Report now includes a grid that prepopulates when the page loads. Customers now have the ability to enter a date range. The old report PDF has been replaced with the ability to export the exception grid. Formatting change for all Search, Clear and View/Print PDF, Export Grid buttons across the entire website. All Grid Export Buttons were moved from below the grid to above the grid. Bug Fix: Current Consecutive Exception Report not updating based on date range filter selected. Bug Fix: Dashboard Current Consecutive Exception Report was displaying more than consecutive exceptions. Bug Fix: Program Management Pages, Route filter now only displays if a customers has routes. Addition of a condition grid with filtering capability. The callout/headers now display the type exceptions instead of a %. The Graph Names and the Blue Header bars all provide links to reports. The Monthly Exception Grid was moved from the Dashboard to the Monthly Exception Report page. Default grid size for all grids changed from 10 to 50. Bug Fix: Add Equipment Page, not updating correctly when a different customer is selected from the drop down. Bug Fix: View Your Reports Clear button not clearing the Lab No (if one was entered). Corporate Level reporting is now available on View Your Reports, DART Select and the Delinquent Sample Report. User can now select "All Customers" on View Your Reports, Dart, and the Delinquent Sample pages to generate reports across their entire corporte view. Enhancement to the Monthly Exception Report. An expanded Date Range option has been added to the Monthly Exception Report. It allows users to generate the report by month as well as year. Enhancements to the Manage Equipment within Program Management. Warning Message displays if a user attempts to duplicate the machine name within the same plant. If a user attempts to delete a machine that already has samples, a warning message displays more prominently. The Sample Count graph has been updated to display Total Samples due and Total Samples received. An average line was also added. Links add to access the Schedule Compliance Report, Monthly Exceptions Report and the Recurring Exception report. Recurring Exception grid changed to display 3 or more consecutive exceptions. Bug Fix: DART Select - Users were unable to select or unselect Customer Review feature on the Dart Page. Bug Fix: Corrected a formatting issue with the download file from Dashboard download grid option. Bug Fix: Manage Equipment Page:- Machine Name is appearing in the Machine ID field when the download option is selected. Enhancements to the Delinquent Sample Report. Enhancement to the Dart Data Page. An export button was added that allows a user to download Machine History. Removal of three icons that all do the same thing and replaced with View/Print PDF for consistency. Changed Customer ID to Machine ID within the Component Information Box and the Footer. Added the ability to link from Dart Data Missing Information to the Manage Equipment Database. Bug fixes for Schedule Compliance. Error occurred when route was selected. Bug Fix for Acid Number, Cooper, Ferrous Wear, and Phosphorus graphs. Enhancements to the Manage Equipment within Program Management. The ability to filter by route and export the Manage Equipment Database grid in 4 different file formats has been added. Enhancements to the Manage Schedule Page within Program Management. The ability to filter by route and export the Manage Schedule grid in 4 different file formats has been added. Bug fix to the schedule compliance report that occurred when a customer filtered by route. Bug fix to the Add Equipment page that occurred when a corporate user sent a request to Add equipment. The company name was missing from the request. Enhancement to the Routes Page within Program Management. The Machine ID column was added to the Routes Page. Bug Fix for the Dart Data Graph. The header was not displaying when the graph was printed. Bug Fix: Fixed problem with single condition filter on View Your Reports. Bug Fix: Labels Page Glitch when machine name and machine id were selected. Bug Fix: Problem on Manage Schedule Page within Program Management for Admins. The complete list of test packages were not displaying . Bug Fix: Problem with Machine Id search on View Your Reports. Bug Fix: Corrected formatting issues on the Compliance Report and a column overlap issue. 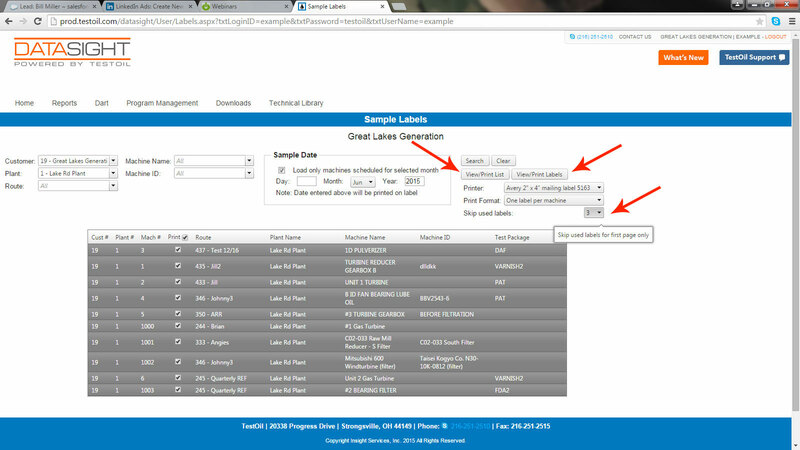 Changed Customer Equipment ID to Machine ID on Add Equipment page to provide consistancy. Monthly Trends now display in real time. The Exceptions grid now includes the machines with exceptions column and the exceptions per sample column. The exceptions grid may be downloaded with or without machine names. The Unknown column has been added to the dashboard condition grid. The Condition Grid, Exception Grid, Machine Exception Report, Summary Report and View Your Report are all based on sample date. A bug fix for the Monthly Exception report that occurred when the file type was selected. A bug fix for redirecting a user from the link in the PDF, directly to the DART Data page, if they are already logged in. Enhancement to the Monthly Exception report. The report has been updated to only display machines with exceptions instead of all machines. A column has been added to the “View Your Reports” grid called “Corrective Action”. This makes it easier to view the history of the corrective actions take. You can also hover over the any corrective action listed to display any additional notes. In the past, you used two logins to access DataSight – the “user” login for general access and then your “admin” login to access and edit certain Program Management features. The new update eliminates the need for dual logins. As a program administrator your new login and password will now give you access to DataSight, as well as all database edit features. Your User Account login and password remains the same. This can be shared with multiple people within your organization to access DataSight. Each customer will now have one (1) Administrator account and one (1) User account. These accounts can be shared by anyone at your plant to access DataSight. If you would like to change your login and/or password, please contact ces@testoil.com (216-251-2510) and they will make the necessary changes for you. Please let them know if you have any questions or need assistance with your account. The Sample Labels page has new functionality and a fresh, new look. User can now create custom filters to sort and print sample bottle labels. Click on the button below to watch a tutorial video outlining the new features. Equipment can be sorted using new filters, which include Plant Name, Machine Name, Machine ID and Route. Sorts can also be filtered for a specific month. When using Avery labels, you can print one label per machine or a full sheet of labels per machine. You can also print the labels on partially used sheets by "skipping" the already used labels on the page. Using the "View/Print List" you can also print a "checklist" of the bottle labels that you printed. Besides a fresh, new look, the Supplies page has some useful new features. Click on the button below to watch a tutorial video outlining the new features. 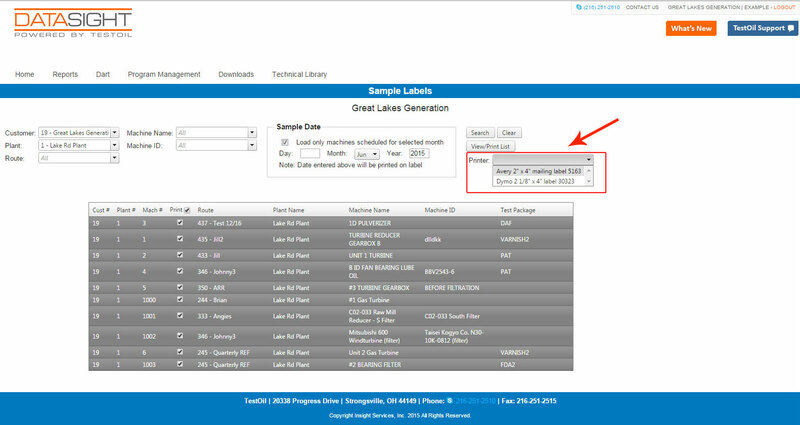 Using the drop-down menu, shipping information will pre populate based on the plant selected. 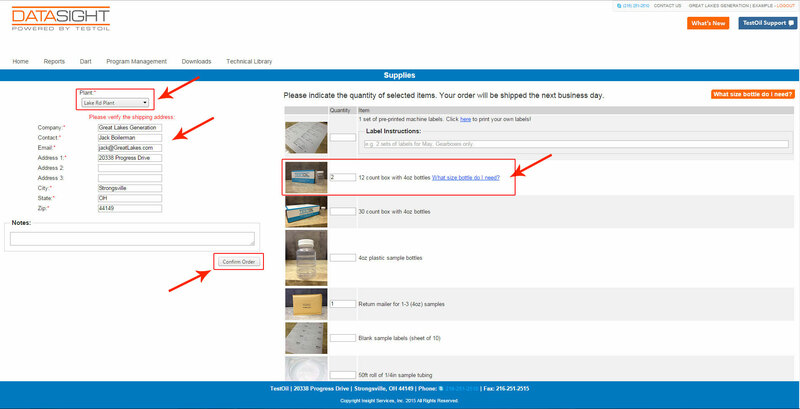 When ordering sample bottles, customers can click on "What size bottle do I need?" to ensure they are ordering the correct bottle size. After clicking the "Confirm Order" button, customers can review the order before submitting. Once submitted they will receive a concise summary via email of the order. TestOil has designed a new report tool called "Last Sample Report,” which allows customers to generate a report of their machines based on their last sample date. As with the other reporting options, customers have the ability to filter by Plant, Machine Name, Machine Condition, Lube Condition, Machine Type, Lube Type, Route and Date range. In addition to being able to generate the report, customers will have the ability to export the results in four different file formats. The file formats include, Comma Delimited, Text File, PDF, and Excel. The PDF and Excel file formats contain links that will allow customers to link to their reports by selecting the Lab No. or to the Dart Data Page by selecting the Machine Name. The Reports tab offers users access to all of their oil analysis reports, as well as a variety of reporting options based on their machine and oil analysis data. 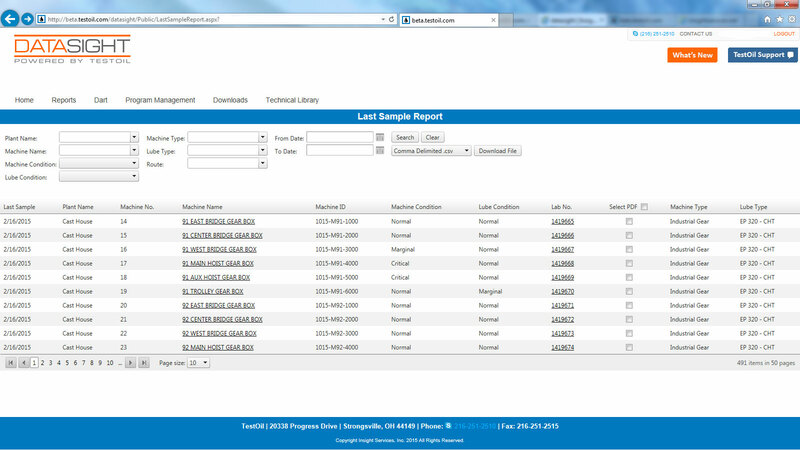 From the Reports tab users can access their oil analysis reports by clicking on “View Your Reports". From here users can view reports based on a variety of search criteria including Date Range, Machine Names, Plant Names, Machine Conditions, Lube Conditions, Machine Type, Lube Type, Report Type, and Routes. Additional navigation and display options have been added to the bottom of the grid giving users the option of increasing the number of reports on the page from 10, 20 or 50. Also on the “View Your Reports" tab, users can now filter their report information by Customer Review, Received Date, Plant Name, Machine Name, Customer Equipment ID, Lab ID and Report Type. Simply click on any of the grid headers and the content sorts based on that header. Schedule Compliance Report can now be exported data in the CSV, TXT, PDF, and Xlsx file formats. The Monthly Exception report also includes enhanced filtering and customers can now select which plants they would like to include in their report. DART is one of the most popular tools on DataSight, and now it's even better! DART is a powerful, interactive tool which enables users to quickly manage sample results and monitor equipment in many ways. DART features several useful tools including a comprehensive Summary Report of a machine's analysis history which can be viewed over an extended period of time; a cumulative history of Corrective Actions taken; and interactive Trend Graphs that can pinpoint a machine’s activity at a specific day and time. Users can now filter data by entering a Date Range, Machine Name, Plant Name, Machine Condition, Lube condition, Machine Type, Lube Type and Route. Users can sort data by: Machine ID, Machine Name, Date Last Sampled, Review Status, Date Reviewed, Plant Name, Machine Type and Lube Type. Simply click on any of the grid headers and the content sorts based on that header. Smart filtering is available so users can begin typing in the selection boxes and narrow their choices. Additional navigation and display options have been added to the bottom of the grid.